Wild strawberries can be found growing all over Europe, but the varieties that we grow in our gardens today were developed in France in about 1740. They are a wonderful addition to a home garden because they are so easy to grow and produce so well, but that is not taking into account the wonderful taste. You haven’t tasted a good strawberry until you have gone out to your strawberry patch and picked a sun warmed, ripe strawberry. Be careful to keep this a secret though, or you might attract all the neighbor kids to come raid the patch. Begin planning for strawberries by selecting a good permanent spot in the garden, as they will be there for a while. They need a sunny spot with at least 8 hours of direct sunlight starting in early spring, in order to produce a maximum crop. They require a well-drained soil, so work in lots of organic matter before planting the strawberry starts, and clear all perennial weeds in the planting site, as they do not compete well with weeds. There are 3 categories of strawberries: June-bearers, Everbearers, and Day-neutrals. Start June-bearer buds in the fall, and then reopen them in the spring to set the fruit that will ripen from May to July, the main crop being in June. This is a great variety if you want to preserve your strawberries in jams and jellies, or for freezing. You get a big crop in a relatively short time, but none the rest of the year. Everbearers are quite similar to June-bearers except they produce buds during long days and have 2 smaller crops. The first is in the spring and the second in the fall. Day-neutrals produce flower buds when outside temperatures are less than 70 degrees F (21 degrees C) and usually produce a light crop throughout the season. There are so many varieties that the best thing to do is ask someone at a local nursery which is the best for your climate. There are a few different ways to plant strawberries. One way is to plant them in a raised bed in matted fashion. Place the plants about 18-24” (45-60 cm) apart. They will propagate themselves, and send off shoots or daughter plants. The patch will need to be thinned out every year or two, pulling the older plants and keeping the daughters. If they are left without thinning, they will produce smaller berries. Another option of planting strawberries is to plant in matted rows. Plant them in rows 3 feet (1 m) apart and 18-24” (45-60 cm) apart in the row. Mulch heavily in-between the rows so that daughter plants cannot take root in the walking path. The parent plants will need to be thinned after each harvest season so be sure to allow new daughter plants to take root. Keep the soil moist in the row so that the daughter plants can take root. An annual hill system is used for everbearing or day-neutral types, but can also be used for June-bearing. Space the plants in a diamond pattern 12-15” (30-38 cm) apart, and do not let any daughter plants take root. Lay down a layer of black, plastic mulch before planting and slice “X” shaped holes where the plants will be placed. This helps control weeds and doesn’t allow the daughter plants to take root. Plant the everbearers and day-neutrals early in spring and clip off all the first blossoms to allow the plant more time to establish a good root system. They will produce a crop in late spring and again in the fall. These plants will only last a year or two and need to be replanted. Strawberries will also do well in containers like planters or barrels. In order to have a good harvest, keep the moisture levels in the soil high and fertilize every 3 to 4 weeks. Plant strawberry starts by covering only the roots and the base of the plant with dirt, leaving as much of the crown above the soil as possible. Then, keep the soil moist so the starts can establish a good root system. It is best to use a drip system to water strawberries to control dieses. If a sprinkler system is used, water in the mornings so the leaves can dry in the sun. The strawberry patch will require a balanced fertilizer each spring, and then again after the harvest, to ensure good flower bud formation. Cover them in early spring with row cover to help keep the flowers from falling off. Your strawberry yield will greatly increase if you use row cover. Harvest the strawberries when they are red, but still firm. It is best to harvest the strawberries early in the morning every other day when they are in full production mode. 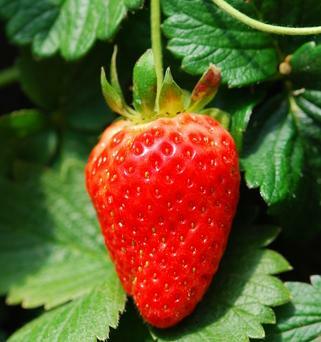 If the strawberries become over ripe, they will attract bugs and diseases. When picking, place the strawberries in containers no more than 3” (7 cm) deep to prevent bruising and crushing. Place in the refrigerator immediately after picking in a high humidity drawer to maximize shelf life. Wait to wash them until they are ready to be used. Frozen strawberries are a quick, easy way to preserve, and make an excellent treat. Wash the strawberries and cut off the caps. Place the strawberries on a cookies sheet lined with tin foil, and spread out evenly one layer deep. Put the cookie sheet in the freezer for 12-24 hours, or until frozen. Then, collect all the strawberries and place them in the freezer, sealed in a freezer Ziploc bag. Strawberries can also be used to make preserves and jams.